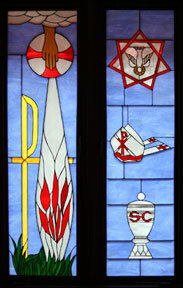 This series of pictures of the St. Michael window was taken in the early evening when the setting sun lined up directly with the window. As one moves up and back down the aisle, the hot spot moves on the window, highlighting different areas and changing the colorations and intensity. 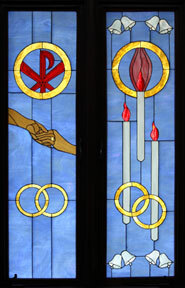 It also put a long area of color down the aisle leading to the altar, and at one time, lighted both the altar and the cross with seemingly separate lighting. Click on each picture to see a larger version of it. 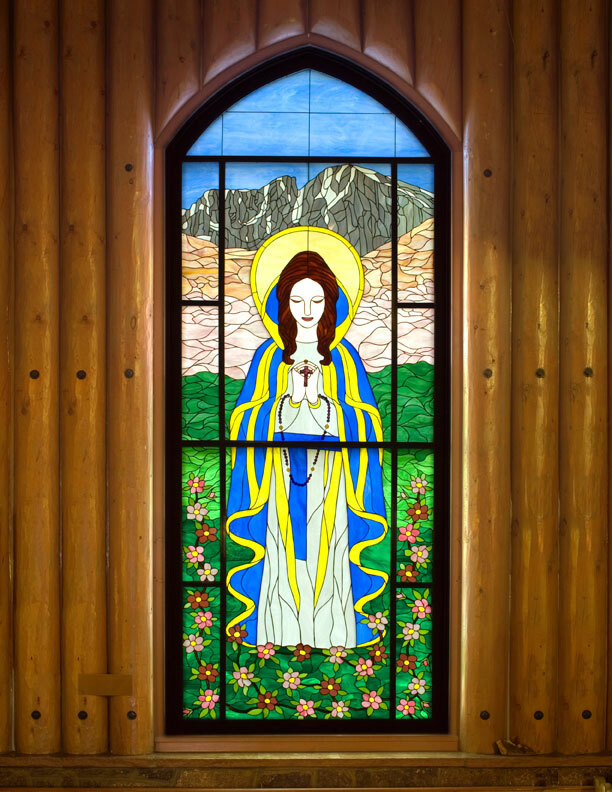 The window of Mary of the Mountain is 4' wide and 11' tall, and has over 1,100 pieces of glass in it. 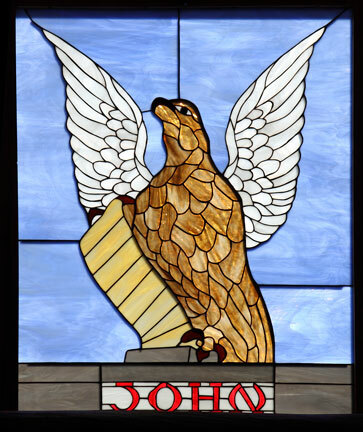 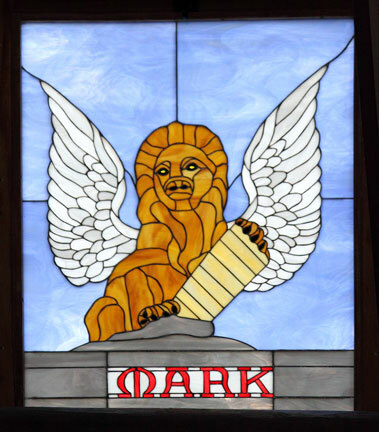 There are 11 sections of glass set into an aluminum frame, which is itself set into the original wooden frame from the original window. 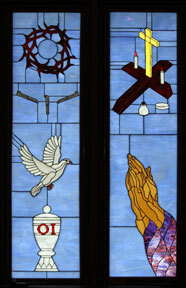 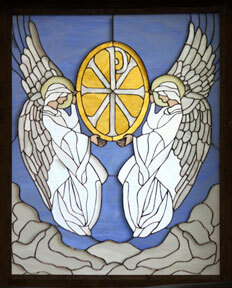 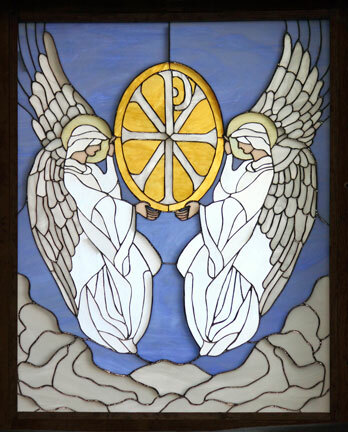 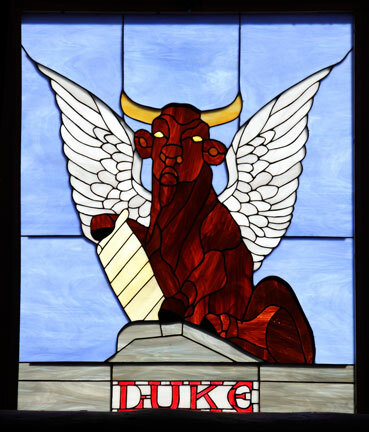 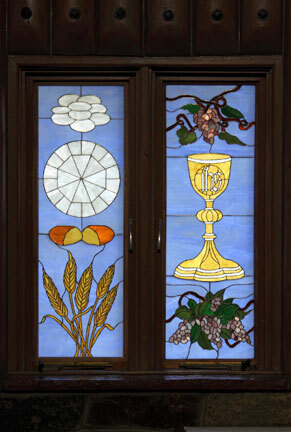 View pictures of the creation and installation of this window. 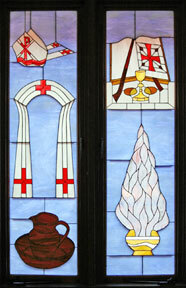 View a picture of the artist, the donor, and the priest. 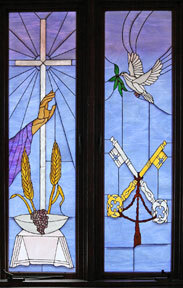 View a picture of the dedication of the window. The finished and installed Divine Mercy window, which is the same size as the Mary window. 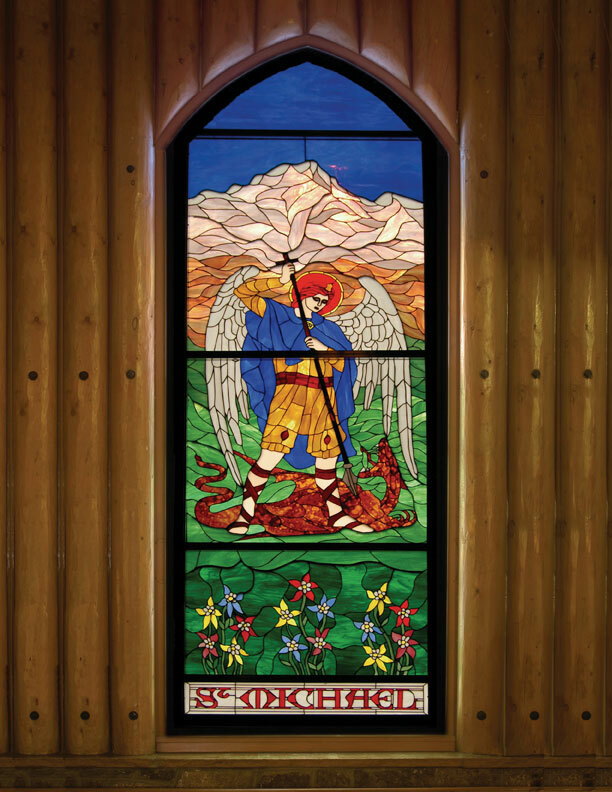 The installed St. Michael Slaying the Dragon. This window is 3' x 9', and has 1,005 pieces of glass in it. 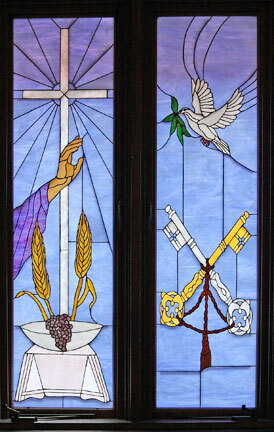 Below are the completed windows of the 7 Sacraments plus 2 windows celebrating the association with the Archdiocese of Denver. 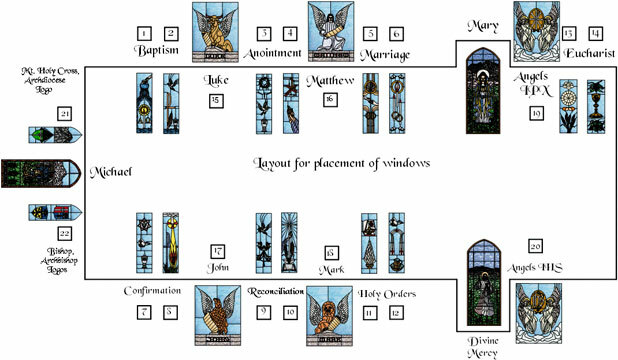 There are another 6 windows in the high dormers which are shown below these 16 windows. 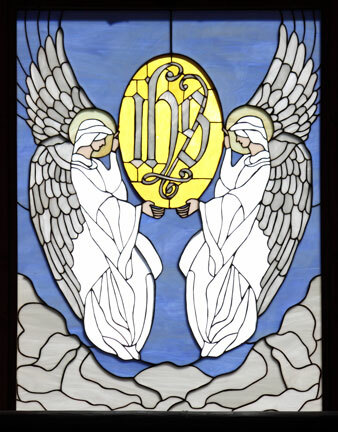 6 high windows. 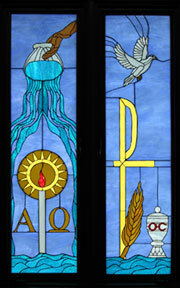 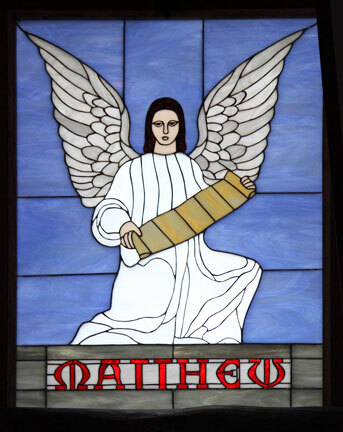 Two are angel designs, and the other four are the representations of the four Evangelists. Layout for placement of the windows in the church.